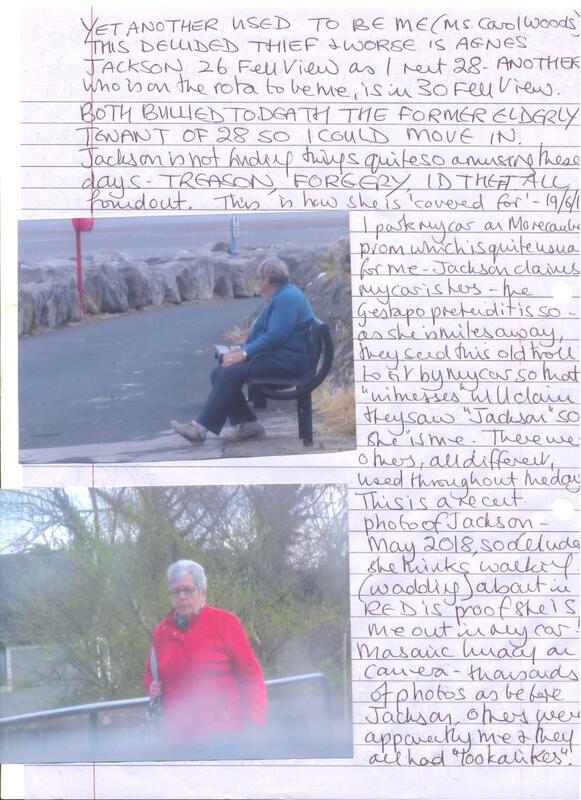 The posts here, copied from Ms. Wood’s communications alone, detail numerous serious crimes, and outrageous hostilities happening to Carol Woods which continue to this day – the archive made of scores of posts beginning in Febuary 2016 after certain “supporters” found out Carol had been placed in a closed mental hospital unit for the 5th [at least] time for no reason. On January 31st 2018 Carol was arrested by Lancs. 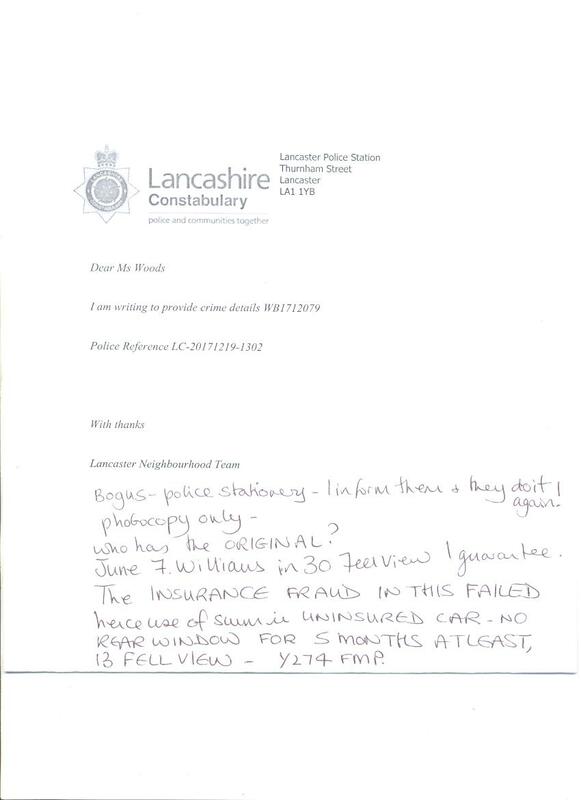 police for being myself – the owner of this site – for allegedly posting articles here – a nonsense charge easily negated by my affadavit / statement as sent to Lancs. police [the statement can be seen in the recent related post put here recently], but nevertheless this unwarranted arrest causing unnecessary hassle and more grief for Carol – the point of the exercise, probably. Sadly, Lancs. 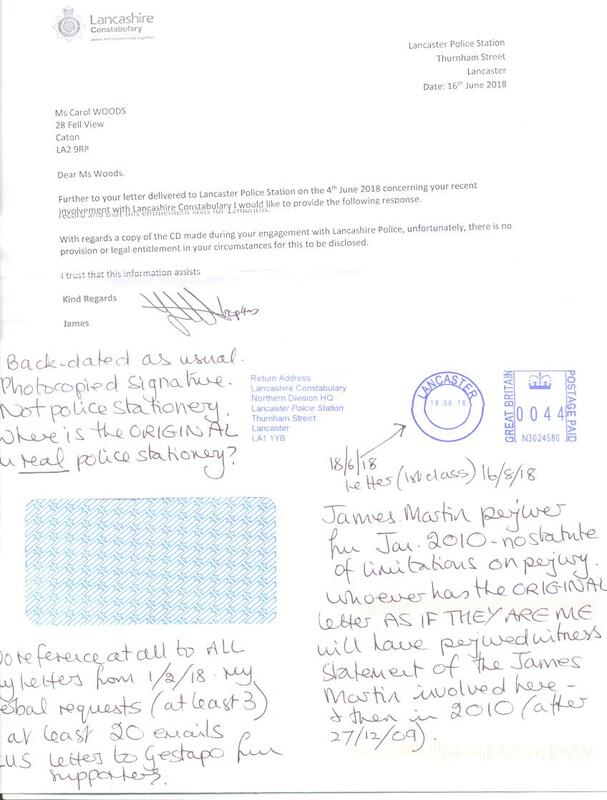 police refuse to answer any communications regarding tis false arrest - they will not forward the custody records, nor the police interview dvd - all highly suspicious! Do they want to make it look like Carol has not been released, or what? Enquiries are progressing...Carol has been falsely convicted in the past on fake charges, by the way. I was right about use of the bankrupt, drunkard and heavy smoker with health related problems from 30 Fell View JUNE FRANCIS WILLIAMS (NB officer TRACEY KENNEDY has a middle name FRANCIS), typing the data from one library miles from Fell View and ILLEGALLY SEEN, the Gestapo arranged their lowlife to pretend whatever their delusions allowed but then as a drove to re-park a Squad van appeared from HIDING as the thugs they are, to confirm they saw MY car and a male sitting PRETENDING TO USE his phone near- by so that was PROOF I am MR CW apparently and he has my car EXCEPT I left him sitting and drove miles to use this library. On my photos - he is not me. Then a squad car and 2 Gestapo crept from hiding; to confirm what? They had found a local hard-faced old troll and she told what to wear to be seen where I was thus she was me as JUNE WILLIAMS and the male was me at my car! The lunatics are obviously on duty. I took photos: the hard-faced old troll had white hair as does J F Williams BUT Williams dyes her yellow to orange trying to get it my colour: she can't do it. Thus the silly old troll is walking along miles away for nothing and Williams walks nowhere with her health problems. The old troll was told to wear sea green as WILLIAMS wore that in 2014 and 2015 often, now it is something else but the Gestapo want this to be 2014 and pretend I have just moved again so they try to make details from 2014 and 2015 be NOW. The letter back dated to 16 June 2018 to try and be COURT JUNK ISSUED TO ME dated 18 Feb 04 but then altered to be 16 Feb 04 (they have always thought they dealt with one as stupid as they are) and posted first class on 18th to arrive on 20th. And yet again ALL dates of significant FALSE COURT DOCUMENTS they think I will "forget". My intelligence is insulted again. He asks that I forward the matter, why is that necessary? It isn't. 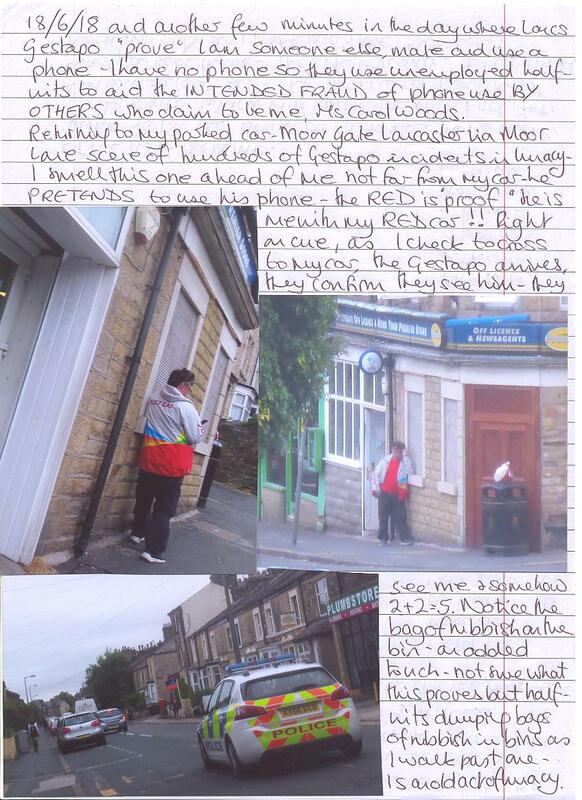 Previously it took a phone call from a solicitor and they in Lancaster sent it to me; that was after the wrongful arrest, false imprisonment and illegal detention of 7 Nov 2015 and PC PERJURER A MASSINGHAM. Why do I have to write? Because THE ORIGINAL HAS GONE TO ANOTHER THEY WANT TO SAY IS ME AND THAT SOMEONE IS AT LEAST A DOZEN, SOME FROM ROUND FELL VIEW LA2 9RP WHERE I RENT 28. Yesterday, amid a great deal of lunacy where "I" was moved out of 12 Fell View which lowlife have claimed and BEEN PAID for years to pretend that Mrs invisible being driven about by them was me, where I moved into a former council house up for sale which has been sold with apparently "me" moving in there as well after selling mine via Masonic thugs and fraudsters, estate agents FARRELL HEYWORTH harassers and stalkers on and off for years, and thus yesterday they assumed I would rush out and send off for the custody records so had JUNE FRANCIS WILLIAMS thief, fraudster and worse out waiting to pretend that she being out was PROOF she was me posting EXCEPT, I stayed at 28 and watched the lunatics all acting their farces, took enough photos to show what I deal with and she wasted her day. Today it is the "turn" of AGNES JACKSON her accomplice from 26 Fell View who pretends to be out and as they claim she is me then she is out posting and I apparently am not. I have not posted. Until I post it will be those 2, O'Conner from 39, Jarvis was 41, Dalton from 45, Rowbottom from 2 Copy Lane off Fell View and so on; they are all me apparently. Only I am not me! He claims I have a year to ask for the records, I know I have and they have wasted 6 SIX MONTHS ignoring me, supporters and so forth who have asked. He claims I do not have a right to the CD made which is now instead of tapes; really? But the ACT he relies on 1984 which I know better than he does I guarantee, thus the law has not changed since I was given in error the TAPES (PRIOR TO CD'S TAPES WERE MADE)THAT OFFICER TRACEY KENNEDY MADE IN LANCASTER POLICE STATION WHEN SHE WAS ARRESTED AND CHARGED USING MY NAME FOR HARASSING HER WHICH ENDED IN A LIVERPOOL MAGISTRATES COURT WHICH TOLD ME (WHEN I FOUND OUT) THAT SHE POSING AS ME HARASSING HER WAS THUS ME HARASSING MYSELF. The tapes of her interview came to me via CPS which tale is told often, anyone can ask as I do not wish to record it again here. The point here is that I was allowed tapes then, the same Act applies and he says I cannot have the CD. Why? Because they pretend I was not interviewed which I would not have been if the NHS they roped in had decided I was mentally ill and needed a secure hospital which did not happen: the bogus NHS and lowlife 7 Nov 2015 they thought they could REWRITE on 31 Jan 2018. On the CD I asked if Kennedy when posing as me "arrested" (more than once) was interviewed by NHS mental health, bogus or not because they always tried to claim I was mentally ill so, if she was me then they had to offer her the same "service". That is on the CD and that is why they will not allow me my copy. That is also why they PRETEND I had not been to ask for my records, and had also handed in letters because if I was "detained" anywhere, I could not have done that. Why was I arrested on 31 Jan 2018? For harassing the old thief and fraudster, lecher and pest in 30 Fell View Mr K Williams who poses as MR CARL WOODS trying to be married to me to make me his horrendous wife. I found out only last week that he had known nothing of any such matter; they had made it up AGAIN relying on NHS to "lock me away" so a jury never gets to see what they manufacture. PERJURY. THE PERJURY OF MARTIN, GRIFFITHS, PERELES, KENNEDY AND THE "WITNESS" ALWAYS SO CONVENIENTLY BRIBED TO SAY WHAT THEY ARE TOLD TO CLAIM THEY SAW, IAN READER IS KEPT SAFE AND REPORTED, IGNORED AND HE THINKS HE CAN SEND THIS DRIVEL TO ME TO AID AND ABET OTHERS. I also note the PHOTOCOPIED SIGNATURE which I will not accept: I want the ORIGINAL with REAL SIGNATURE. I attach enough of one to a supporter of mine which is real stationery. Martin needs to know that there is no statute of limitations on PERJURY. I also attach ANOTHER they sent me in Dec 2017 after they arranged for my car window to be smashed and arranged then the lowlife round Fell View to slash the plastic covering and then send them to stand in a group when I went to repair the slashed plastic so they could provoke me to respond and then scream they were victims! MILLS from 20, HUNTER from 22 and at least 2 others involved and apparently, I live with all of them, they are ALL paid to claim they drive me about and "care for" me as a "relative". I ignored them: no one called to take a statement about my car window. 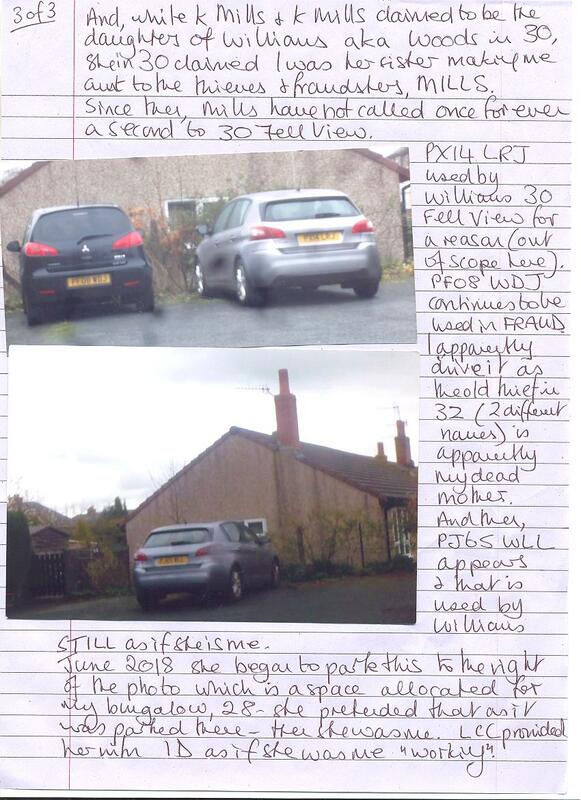 It was sent to me so I would claim on my insurance and in that they had again JUNE F WILLIAMS in 30 Fell View (she with ID as if she is me for HMYOI and now LCC for "work" she does not have) go out and stand about by insurers and pretend that MY claim was proof she was me as she was seen there! I did not claim on my insurance; WHERE IS THE ORIGINAL TO THIS? I hope he's not waiting for me to use the numbers he has provided: why would I want to speak to a liar, dimwit, and perjurer? I attach the last emailed fraud of Williams and she with Mr an old lecher and pest is why they have seedy old males stalking me and being seen where I am to make me seem to have one in tow thus proof that old fraudster is me. I attach the pages of photos of officer Kennedy at MY house leaving for one of her many jobs and ask again for her rank and badge number. 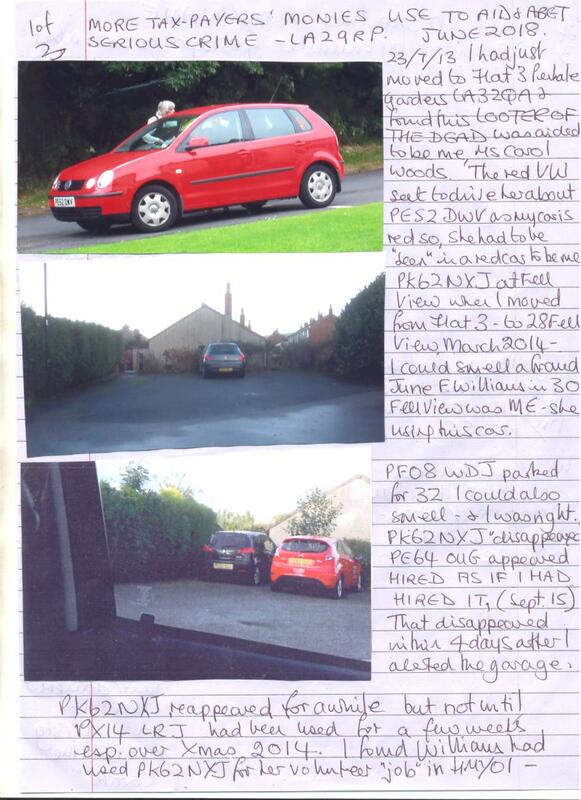 The photos also show YK02 VPF car of murder victim which car was then said to be MINE with another old thief and fraudster given a provisional licence as if she was me and she LOOTER OF THE DEAD plus one old troll used often at 33 Fell View as I also apparently live there "disabled" and this one calls with keys provided to PRETEND she calls on "someone " invisible: ME in fact. That lady from 33 Fell View is MISSING and has been for 4 years at least. WHERE IS SHE? I know of at least 4 such "disappeared" elderly lone people. Dear Sirs I have sent out a few times photos of yobs and others who are sent to try and be where I am so that their phone use can be said to be mine or at least linked to me. THIS IS TO COVER FOR THE THIEVES AND FRAUDSTERS ROUND FELL VIEW ESPECIALLY WHO USE THEIR PHONES AND INTERNET FOR GAIN AS IF IT IS MY USE. THE ILLEGAL AND DANGEROUS WIRING INSTALLED IN 28 FELL VIEW LA2 9RP READY FOR MY MOVE IN 24/3/14 AIDS THAT. I found that wiring and the loft devices because I have a brain and ears. Anyone can ask for photographic proof but for this, the first attachment was sent with my ALDI shop till receipt showing that while a pair of yobs and and old doxy sat parked near to my car but among others so I would not see when I returned to collect it (they drive off when I do usually and that is PROOF I was using their phone(s)) but as I saw and it seems unlikely I was anywhere using a phone as I was shopping (aside from the detail that I do not have a phone whatever the Gestapo and their trolls manufacture which I hear via the loft noises in 28 Fell View). The 2nd attachment was then a "revised version" and the lunacy is that I am not supposed to notice these cretins. This one stands and pretends to use a phone in the most unlikely spot again not far from my car. AS ALL I DO IS MONITORED ILLEGALLY he is "in place" ready for me to almost reach my car: I could smell the fraud and am never wrong. Right on cue, he with his RED in the lunacy of wearing red to be PROOF they are me with my red car, and the Gestapo cruise round to confirm they see him thus he is me and my car is his! Notice the bag of rubbish on the bin: I have no idea why they do this but they often have sleazy rushing to dump rubbish as I walk past a bin, it clearly proves something of their delusions. A squad van was also in use but I was negotiating my car from its space so did not get a photo; this halfwit then "disappears" which is added PROOF he is me driving my car! This is ONE example; there were many like this and all on camera for any enquirer. 24/5/15 and the NHS (corrupt bullies, liars and worse in my now vast experience) park at 33 and AGAIN pretend someone is "ill" (me) and they attend. The car DK51 HVL was used for over 3 years by local unemployed roughneck who claimed she drove about ME from 33. The tax-payer funded her with a BLUE BADGE FRAUD where she got free parking when out alone as Mrs Invisible was hard to see. I have offered all the proof which was ignored. This woman would sit and wait for up to 3 hours a time waiting to stalk me if I went out; if I did not go out she would drive to where I found she lived. 8 Beck Side 2 mins from Fell View; sometimes she was to drive up to me in my garden and glare at me to "menace" which was ludicrous. But I complained about that and apparently that was a sign I was mentally ill yet only 12 months earlier JACKSON the thief and fraudster from 26 Fell View who was ONE claiming to be me, reported that I glared at her and that of course brought down the wrath of God, (the council legal rep); she as the deluded thief and fraudster and thinking she is me apparently is not proof she is "disturbed". 27/1/18 and yet another night of thuggery with cars hiding behind 31 Fell View in the yard there: out of sight of me in 28 Fell View, they wait for me to retire for the night then leave 31 and PRETEND they drive me to a SECOND ADDRESS without explaining how I am in 28 Fell View if, for example, I get up at 4 am for a drink of water. The thugs have done this for almost 4 years and they hide in their cars and use their phones and internet as if it is MY use. CW55 AYM car is ONE used as routine with a photo of that driver lying across his front seats to pretend his car was unoccupied. That is STILL done such as night of 15 June 2018. 31 is a flop house and used by sleazy who hide and pretend whatever their delusions allow; I wonder what is "in it" for the unemployed foul mouth who seems to run that household. 19 Copy Lane is another used the same way which is 1 min from Fell View, 39 Copy Lane and 37 Fell View, all are the same types with the same types used. ALL are used as stalkers and worse and most are on camera. On Sunday 17th June 2018 amid INTENT and PLANS, ACTIONS to have me said to be committing the crime of "following" (thieves and worse), I had not gone out so could not be part of the thuggery in manufacturing that crime using those in 30 and 34 Fell View who claim to be me, for GAIN. Thus, as usual, the harassment and lunacy is brought to me in the hopes that it forces me to go out when all I did was to take photos of events. The use of 33 was in full swing from mid morning, SOMEONE provides council keys for that unoccupied property so the sleazy can all and PRETEND whatever their delusions allow. 29 and 31 were also in much use and cars and at least 1 van hid in the large yard area of 31 pretending that someone moved into 33 AGAIN (now there are 2016 persons there, all invisible), that went on for HOURS with cars flying about when I went into my front garden trying to work. Then 41 began their frauds PLUS 20 and so on; 30 and 34 continued until they all gave in but not before 9 30pm. YOU FUNDED ALL THAT. Mrs PECK IS MISSING AND HAS BEEN FOR OVER 4 YEARS, WHERE IS SHE? She is not me. Ends. Carol Woods under duress at 28 Fell View LA2 9RP. Late Saturday night I had been to drive round to see what lowlife parked to hide to set off after I retired for the night so they could pretend their frauds: I found one used often, the headlights were from black VW DK51WOH found to be as close as possible to DK61 HVL. Last week I predicted that JUNE FRANCIS WILLIAMS of 30 Fell View LA2 9RP would appear in court as if she was me, Ms Carol Woods of 28 Fell View after seeing AGAIN that she had had ID provided for her by the county to have her wear ID and PRETEND she was me. That done in 2014 when I first moved to Fell View and found out which ID then was for her to work as "volunteer" in HMYOI Lancaster Farms and when she FOUND OUT fast "resigned" on SUNDAY 18 May 2014 (in a bogus phone call) saying she could not manage the paperwork. Thus many events from 2014 are being "revised" as if the original events had not happened but only happen now. Hence her being given the ID but by LCC this time. Williams is coarse, rough, foul mouthed and the opposite of me (and much older) which is why she was READY TO BE USED for when I moved in the farcical Masonic inversion in lunacy. The Gestapo Masonic branch organise all this sulking because my whistle-blowing of 2001 prevented them getting the Super Casino in Blackpool. Out of scope here, I add now what WILLIAMS and entourage were AIDED AND ABETTED TO DO ON 17TH JUNE 2018 after I sent out my prediction to various and alerting the local county court. On 7 Nov 2015 I was arrested for "following someone to a local airport" and illegally detained for 4 months mainly as I had been in Barcelona at the time I was busy following liars, perjurers, thieves, fraudsters and unemployed lowlife in 45 Fell View who are MORE to claim to be me. To make Dalton then the reverse and have them witness a crime committed by me (the Gestapo use all their known felons for the "witness" needs) the Gestapo wanting to link any going away I have from Oct 2015 to a "following" on 23 Oct 2016 had DALTON "witness" other lowlife proven fraudsters linked to WILLIAMS in 30 Fell View, the fraudsters from Copy Lane off Fell View, ROWBOTTOM in PO11 XTL white Seat, one of 2 cars they have as long-term unemployed. They were to park on Fell View and wait for me to go to my car so they could race off ahead of me and then scream that I followed them thus committing the "following" crime and linking to my holiday planned for days later. Dalton was to hide in her doorway and then walk out to claim she saw me get in my car thus PROOF I was to follow Rowbottom. They are all so utterly devoid of intelligence I knew exactly what they planned and simply stopped for petrol en-route to my destination. That spoiled any "following" farce. Williams do nothing at all, ever. I had recorded and sent out information that I had caught her red-handed AGAINN using her phone as if she was me and that I had suspected that those she contacted pretended that she was me knowing she was not. Those included BLENKINSHIP thieves in 34 Fell View where my records have the times and lengths of events linking 30 and 34 which I could only think was that fraud of them "working together" A CONSPIRACY no less. Blenkinship have druggies and all kinds in 34 Fell View and claim the druggie from 2016 and early 2017 was my daughter. She was a bleached "blonde" and last week I had many such dullards all "blondes" all walking up and down in front of me in 28 or stood by my parked car when I was out, they sent by the Gestapo and ALL using phones and ALL total strangers. That was part of the plan for Sunday and a "following crime" again. The Gestapo ILLEGALLY knowing I go away soon. I had been right about Williams in 30 and Benkinship in 34: she in 34 is a younger version of Williams, unemployed long-term, rough, coarse, loud and a thief at best. 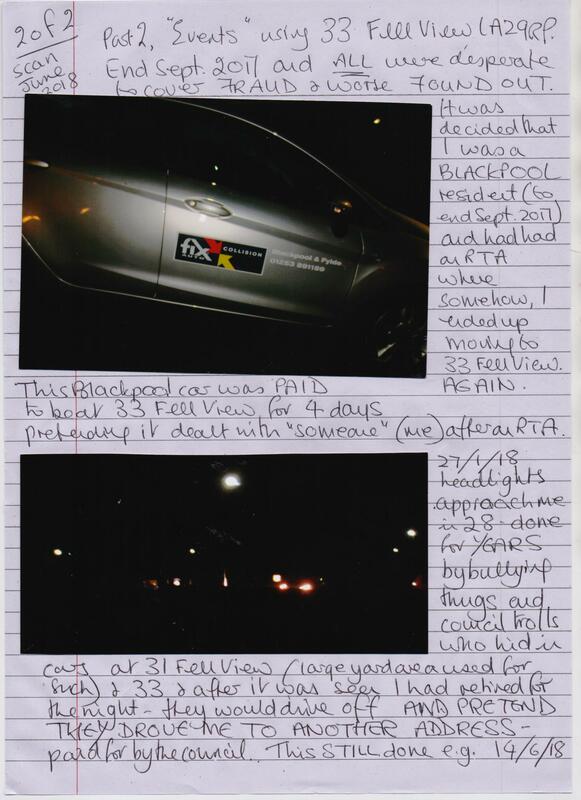 I did not go out on 17th which spoiled all; but at 6pm approx Blenkinship appeared with Williams at the rear of 30 and they had had a RED FIAT provided to drive WILLIAMS about and claim it was proof she was me in my red car AND to be a car I had not known thus I would not know what lowlife to watch for in "following". Blenkinship and Williams THIEVES and worse, were all to be witnesses for each other "being followed" by me! Blenkinship then went into 30; they are tiny bungalows and the only sound was a TV in the bedroom of 30 where they have 2 TV's as one is REGISTERED TO ME. I have no TV. How could 4 loud mouths be indoors and not a single sound in chat? They were not talking: I heard the LOFT NOISES and knew they texted each other while sitting indoors in 30 together! (Another set of photos and data goes out later with that E-CRIME seen on Saturday 16th.) Blenkinship then left, Williams shouted, "See you Carol(e) and Anthony" which was so staged it was pathetic. Williams have a daughter Carol(e) who they do not see, some weeks ago, after I sent out data again about the child abusers in 23 Fell View CLARKE ,where I apparently live as sister to brothers in there, one called ANTHONY, then Williams was contacted to pretend she had had a Carol(e) and an Anthony in 30 whom she saw out early evening saying exactly what she said again on 17th June 2018. But that first time, I had been stood in my doorway and watched NO ONE AT ALL walk out as there had been no one there, (the use of invisible persons is common)thus they were rewriting that earlier farce. I found that one brother in 23 is ANTHONY. My brother is not called Anthony and, as there are 2 in 23 Fell View, the other Luke, and I have only 1 brother, who is not called Luke either, there is no confusion. Thus Blenkinship become someone else which is also common round Fell View: Reid in 49 are aka Moss, Lamb in 32 is aka Reid, Mills in 20 is aka Staig, many are aka Mr and Mrs Woods, and so on. This morning Williams was to stand and shout at the front of 30 in another bogus phone call. She was making NOW be 18 may 2014 again at the front then BUT the weather was lovely that day in 2014, today it is not so lovely aside from the FACT that 18th today is Monday and not Sunday. The RED FIAT provided (as dozens of cars are provided at tax-payers' expense) was Pk12 OMT. It had to be RED and it had to be as near as possible to PK62 and for why, read on. Photos attached. 1 of 3 and when I rented Flat 3 Penhale Gardens LA3 2QA prior to moving to Fell View, obviously Williams et al were not me then as those in the flats on Penhale Gardens were me. This one LOOTER OF THE DEAD Flat 5 was ONE "me" and provided with provisional driving licence as if she was me. Here she was driven round in a RED VW PE52 DWV to be seen in a red car as proof she was me. 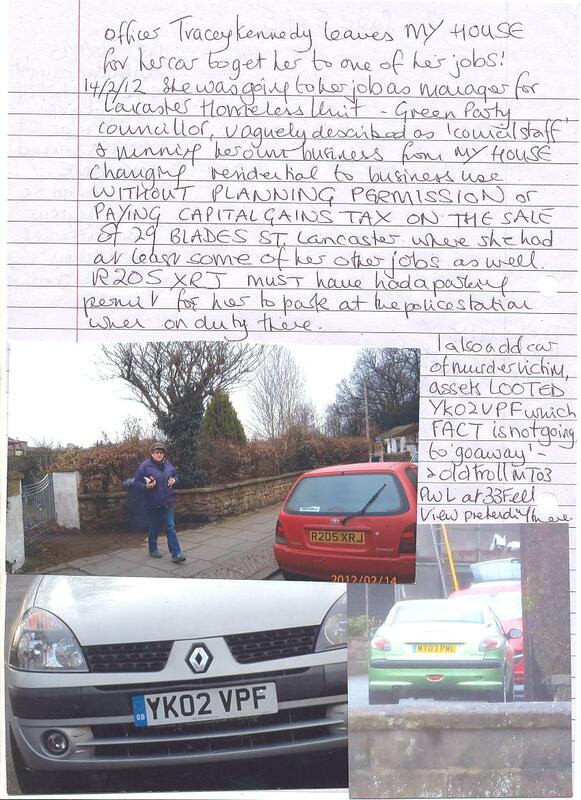 Then March 2014 I move to Fell View and find PK62 NXJ parked with PF08 WDJ (seen in 3rd photo that page) I could smell fraud and wrote to the council saying they had better not be anything to do with me. I had been right; WILLIAMS used PK62 NXJ for her work in HMYOI IN MY NAME but as that car is on their CCTV and mine was when I went to report her, we seem to have a problem FOR HER. PF08 WDJ is LAMB in 32 aka Reid as she claimed to be my dead mother being driven about by me in that car. PK62 NXJ "disappeared" and a red Ford appeared but it did not move, I contacted the garage smelling a huge rat and was right: that then disappeared and PK62 NXJ was returned. But prior to that another silver grey Peugeot had been provided for Williams PX14 LRJ and that for a reason out of scope here. That then disappeared with PK62 NXJ back again. On 20 April 2014 I had been in 28 Fell View from 24/3/14 and this car arrived with loud shouts of the driver being their daughter; if she had not been almost as old as they are, I would not have thought anything about it. She was a fraudster sent to use 30 and pretend they were me and SELLING MY HOUSE as "too disabled" to live in it! MAZ 7675, photos of her on request. That type of FRAUD is done OFTEN using lowlife with "visitors" to make me think it is family when the lowlife are posing as me and claiming they can sell my house. Thus the "daughter" of April 2014 seems to have lost years and become Blenkinship with a red Fiat (and 2 other cars at least). BUT K MILLS in 20 Fell View is also the daughter of Williams, and Williams posing as me with claims that I was her sister meant that thief and worse Mills in 20 was my niece. She has a sister so, Williams did not have just one daughter but 2 and they were my nieces. 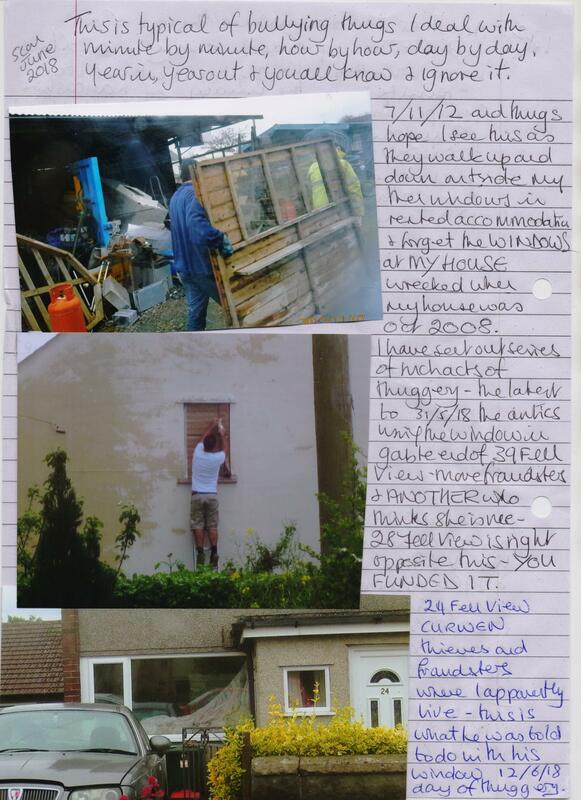 I apparently rented that squalid caravan you can see at 20 dumped on the front yard area of 20 soon after I moved into 28 by the council and Gestapo who then had MILLS claiming and paid in FRAUD to be carer and driver of "Mrs Invisible" (me) and to rewrite that caravan which was finally moved late 2016, they now have large pick-ups at 20 with rear covers and that is the caravan "rewritten". Thus Williams having one daughter they do not see and we now have 3 without Blenkinship. This is also "usual" persons with no children or family are found SOME. Oddly, Mills have not called ONCE to 30 to see their "parents" since mid 2014. Dear Sirs This is usual for me in Lancs police led frauds, ID theft and OTHER SERIOUS ORGANISED CRIME. I add these today to show what they PLAN and ORGANISE every single day whether I am in 28 Fell View LA2 9RP or go out. The ILLEGAL GPS on my car allows for this. If I park in the middle of nowhere to prevent such, the Gestapo send their thugs to park anywhere they can near me and use their phones as if that is PROOF of anything except ILLEGAL MONITORING and THUGGERY. I left Lancaster library earlier after sending 2 emails in particular about E-CRIME and links to me and on my return to the quiet room where I can use this scanner and terminal, the usual cheap "blonde" was in, shouting into her phone: she used the library, she shouted, as it was quiet, it had been until she entered. I took a photo and saw she was the "type" used, cheap, loud mouthed, coarse and bleached haired and apparently shouting to "SARA/SARAH" which is the bogus daughter of JARVIS in 41 Fell View who claims to be me as I have a daughter of that name who is a natural blonde and an engineer who works round the world: she does not behave like the cretins found to pester me do. Nor is she in UK let alone the local library. That though is ARRANGED in lunacy all day, every day, one permutation or another. The attached photos; my till receipt from Aldi, a store I used on Saturday 16/6/18. It was the last store I used before dropping my shopping into my car parked away from the store on Morecambe prom. Walking back to my car AS USUAL I found the undercooked suet puddings in their car, VW DV58 LCJ, which car I was not to notice among all the others parked: the suet puddings had been taught to text each other in the same car, this is what VARIOUS do round Fell View and pretend that one is me. My store receipt shows 16.40hrs. They were on their phones while I was shopping, how could I be one? I then waited to walk along as there is ALWAYS another not far away and had I driven off, I'd have not found this one. I dropped off my shopping and went for a walk. I found a seedy looking troll almost hiding in her car, W273 UAC the blue Nissan, in poor condition with the driver the same and looking guilty; being far too interested in me walking along. Thus they using their phones for nefarious activity and I was not surprised that both cars raced off after they noticed that I had not driven off but was taking note. Ends Carol Woods Msdoors "hiding". 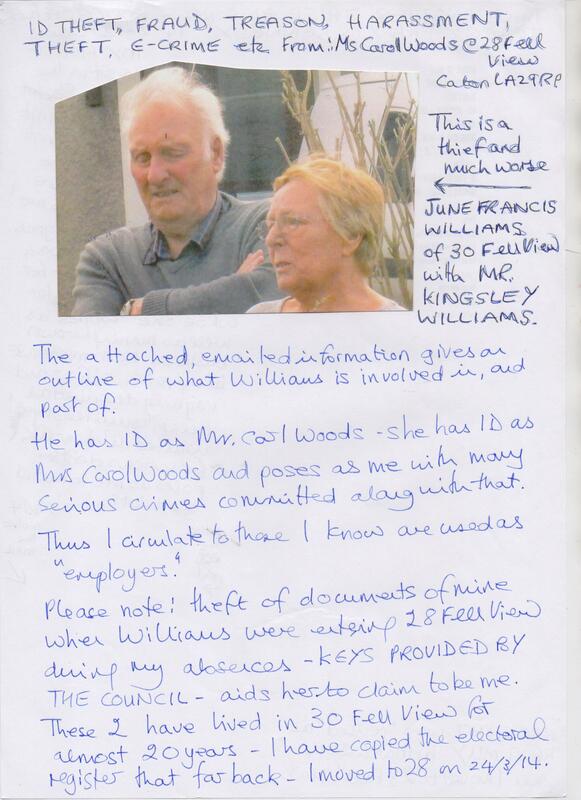 And that was all part of the plan to make them proven to be me, she JUNE FRANCIS lumbered with Mr K Williams. JUNE BLENKINSHIP is used partly because of her name to muddy waters of which JUNE I refer to. There is also the month to factor in. Ends. Carol Woods Ms.
No one questioned that lunacy on 31 Jan 2018. The HARASSMENT LAW is quite clear which only I seem to know about: 1) if the action is to prevent a greater crime then it is not harassment. 2) harassment is following a course of conduct and a warning is given if a course of conduct is followed. How could the ONE email they claimed I had posted from Bournemouth as a male be a course of conduct? The subject(s) being SERIOUS THIEVES FRAUDSTERS, E-CRIMINALS, FORGERS and more who a) bullied to death the former tenant of 28 Fell View because they were told to (so that I could have it and they could do same to me) b) pose as me for GAIN which is proven beyond doubt: I see no queue forming to help me prosecute those criminals. Where was the course of conduct proven? When was the warning given? When were the ID THEFT and GAINS interviews with me take place? They didn't of course. AND WE HAVE ANOTHER WRONGFUL ARREST AND FALSE IMPRISONMENT WITH THE INTENT OF SUGGESTING THAT I WAS MENTALLY ILL GIVEN THAT THE GESTAPO FAILED SO DISMALLY IN PAST TO SHOW THAT. The silly woman told I did not want her in the interview after when she was forced on me to PRETEND I needed an "appropriate adult" when really, she looked to be in need one, your solicitor at no time batted an eye lid when I tried to insist that the interview was PRIVATE and not for such a one sent to claim something untrue which was HARASSMENT of me as that had been done 3 THREE TIMES in 13 hours. I now find out that the supposed victim (for which read thief, liar,harasser and worse) KNEW NOTHING WHATEVER ABOUT THE MATTER I WAS ARRESTED FOR. HE HAD NOT COMPLAINED; HE HAD NOT SEEN ANY POSTING AT ALL (aside from the fact that I had posted nothing). He is apparently married to me with an alias of MR CARL WOODS. I have no custody records STILL. Yours etc Carol Woods - we appear to have LEGAL AID FRAUD INVOLVED. payment for your services for no legal reason. Dear Mr Graham, I have cc you into an email sent to the solicitor involved on 31 Jan 2018, HOLDEN's of Castle Hill Lancaster. I have informed them of the law on harassment (which I was charged with harassing a thief, fraudster, liar, and worse who poses as MR CARL WOODS in 30 Fell View and pretends he is married to me) his real name is KINGSLEY WILLIAMS. The solicitor's have not responded at all so I won't bother them again if they ignore me still. They seem to be ignorant of the law of harassment anyway and now I find out that Mr whatever he wants to be known as, knew nothing about the matter at all of arrest for harassing him. This is TYPICAL of the lunatic in residence of Lancashire IAN YOUNG who manufactures "victims" as often as people make a hot drink each day. YOUNG then creates the "statement" the supposed victim makes and copies a photocopied signature if possible or just makes his own up. They almost had hysterics when I walked in with my first hand written request as i was not supposed to be "free" to do that! 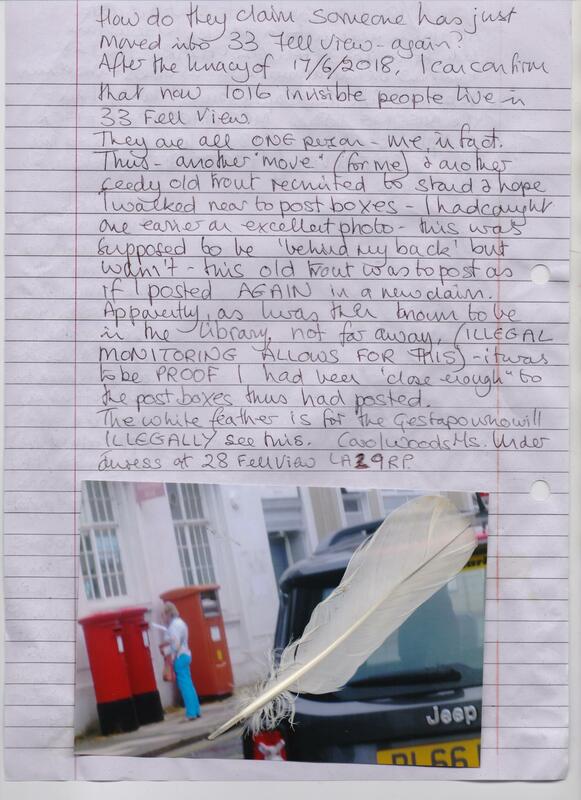 I sent the photos of the deranged at the solicitors when i took another hand written letter for them early this month. 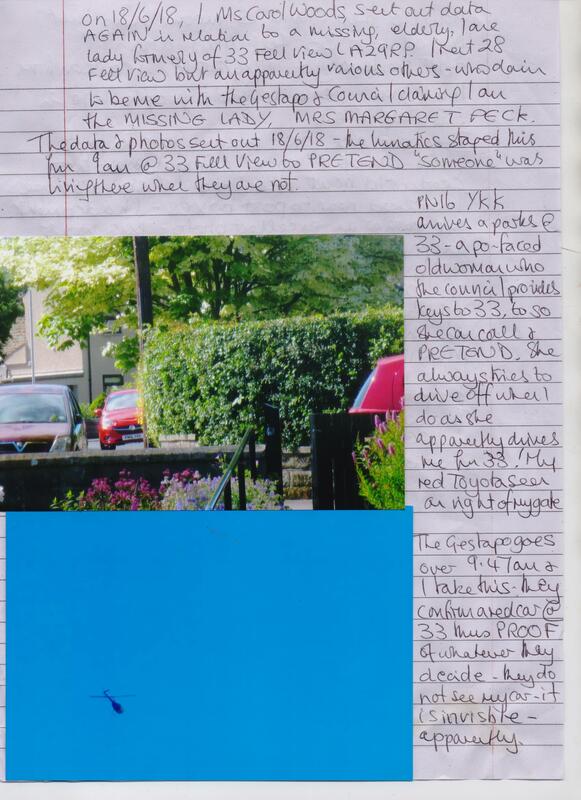 Yesterday, I Ms Carol Woods of 28 Fell View LA2 9RP sent out data and photos related to the MISSING ELDERLY LONE LADY Mrs MARGARET PECK of 33 Fell View which UNOCCUPIED house now has 1016 invisible people moved in, one at a time over 4 years and they are ALL me apparently as I am Mrs M Peck. Today, the Gestapo livid about what I sent out and as usual set about using their demented halfwits and lowlife to stalk and pester and claim to be someone from Fell View just where I am as PROOF those others are really me to leave me "free" to be someone else. Without going into all details, a few photos taken which will be sent out when the time is right, I can add that to mid afternoon, those sent YOU FUND, were all to be AGNES JACKSON the deluded thief and worse from 26 Fell View who the Gestapo have set up to be ANOTHER "me". Thus ALL those "seen" where I was at the times were proof that Jackson is me when only last week it was Williams in 30 Fell View who was to be me and then O'Conner in 39, Jarvis in 41 and so on who are ALL me apparently. I seem to be in 33 with all the other invisible persons. Thus first thing today and WILLIAMS pretend to go out and hide in 30 with a local yob racing off in their car PJ65 WLL registered to ME to make it seem as if they were out when they were not. 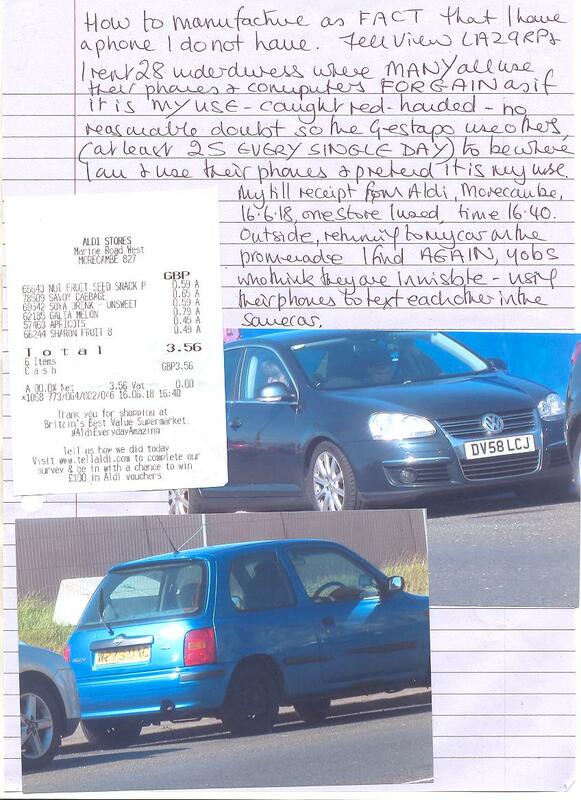 They do that to use phones and TV as if it is my use they claiming they are out with the car not seen as "proof". My car parked at 28, RED TOYOTA is invisible apparently. Then as on the photo, unusually for a weekday as this troll is used on Sundays (so must be paid double time) PN16 YKK a known stalker who thinks I am stupid in that she parks at 33 and then stalks me when I drive off in my car and she pretends she drives me from 33 as the roughneck in DK51 HVL did for over 3 years being paid in FRAUD. Thus I take the photo at 9 30am and my car on right of my gate seen. The car DG04 UXR seen is O'Conner's in 39, one of 5 they as unemployed have and he uses that to pretend he drives me as well as apparently, I am Mrs O'Conner. At 9 47am I take this of the Gestapo helicopter hovering over to confirm they see the RED car at 33 (mine still invisible) and PJ65 WLL not seen so they confirm that Williams are out and my car is not there and "someone" tends to Mrs Invisible in 33. Then another car arrived at 33 to aid that farce at which point I drove off and found the old recruits used were sent to be seen where I was as I was out as Agnes Jackson who is also me. They had not stopped there: I had had the usual dullards in long lines next to each other each with a pram and a baby/toddler as I am to see them (all gawpers) and forget I have my own children and think all I know are those who easily use their children when instructed and I wonder just how far they would go to appease the "gods". Thus I knew we had a day of my being someone else. Jackson in 2015, for example was to walk to 26 waving about 2 T shirts for a 2 year old and pretend she had grandchildren as she is me and I do have. They are not that age. Jackson has none and never will have; in fact 99% of deranged and deluded who claim to be me have no family as I have at all. Jackson will never have a daughter in law. A year after she was to wave about the T shirts (loaned for the farce), she was loaned at least 15 items for a new baby to hang on her line (dry, not washed) and pretended she was a grandmother. (She is well into her 70's.) She was given beer towels for bar use in the fraud using Williams who did work in a pub and drank the profits but as Williams is me, then it follows Jackson is and thus Jackson had to have the beer towels to hang out (not washed) so I would see and think that, after all, I was Williams with a pub link. The lunacy goes on in such a way almost daily. But the Gestapo ILLEGALLY see my photos when I develop them in Max Speilman so they set about "rewriting" the "history" of today and thus, they send evidence that evolution goes backwards to be seen by Gestapo near my car which is PROOF apparently they are linked to me. Then after much of that, I return to the library and have to pass the post office again. This time they had lowlife to stand about and he smoking cannabis (heavens above, whatever serious crime will be committed next !!) was to blow the smoke in my face (this is such an old boring act of thuggery) which is PROOF I smoke cannabis thus am someone else but who? We have resorted to me being a niece of mine yet again; she with the drug problems of her young years and thefts etc and she is also me, apparently. BUT she has never been to Lancaster and would not know where Caton was; I last saw her briefly end 2011 when I visited my sister who is said person's mother. Moving to Fell View the Gestapo used roughnecks and thieves in 12 and 14 Fell View and they claimed I had moved in with them (total strangers thank goodness) BUT one I have to think now after learning who is who and who is paid to stalk etc, NICHOLA McGUIRE of 14 Fell View was twice to stand away from the front of 14 and make sure I could see her in the roadway using her phone with the Gestapo cruising up and down to confirm they saw her with a phone, so what? She had been told to wear a fawn knitted jacket a type one of my daughters wore YEARS earlier but McGuire seen in a similar garment was proven thus to be my daughter and was PAID to pretend to drive me about and "care for" me as Invisible which 24 others were also doing at the same time. On Saturday last, amid the lunacy and taxi thugs etc, seedy old males and all as usual, a woman was sent to rush to Lancaster Sainsbury's as the Gestapo assumed I headed there; she was a McGuire type thus the dark haired type (suddenly, "blondes" are not in use this afternoon) and thus in Sainsbury's when I was and bingo, not only was McGuire my daughter but so was my sister's daughter from miles away. Except I did not go into the store; she wasted her time. 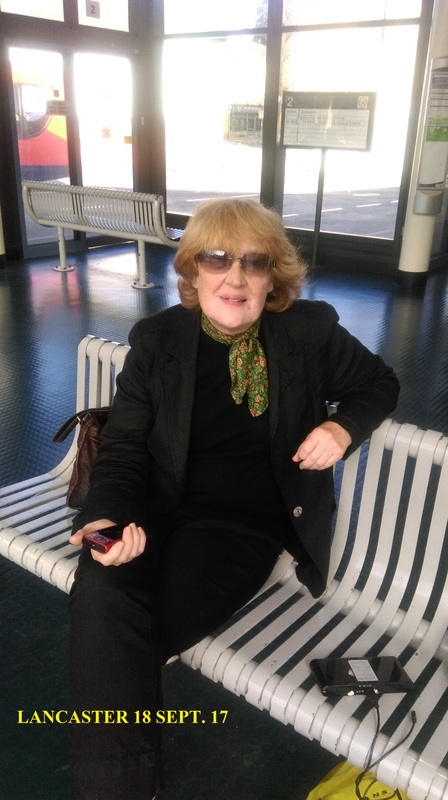 Today, after the Gestapo ILLEGALLY saw that I developed photos of fraudsters posting WITH INTENT, they tried again and had a woman similar to the one used Saturday and she was to hide near the post office then rush in when I walked past and somehow that makes her my daughter and thus I am my sister miles away! I took her photo; no one I know but I also think the use of silver Ka's is to aid and abet thieves and lowlife ELY in 12 Fell View, unemployed in a self-made slum who were bought top of the range 4 wheel drives and at least 2 other cars with a silver Ka to pretend they drove "someone" about in that and the disappearance of OTHER ELDERLY LONE LADIES was found out in that and what takes place; thus Mrs M Peck is not the only missing elderly lone lady I have found out about but a Mrs Olive Greenbank from 28 Fell View prior to me also PLUS at least 2 others from an earlier COUNCIL address of mine. 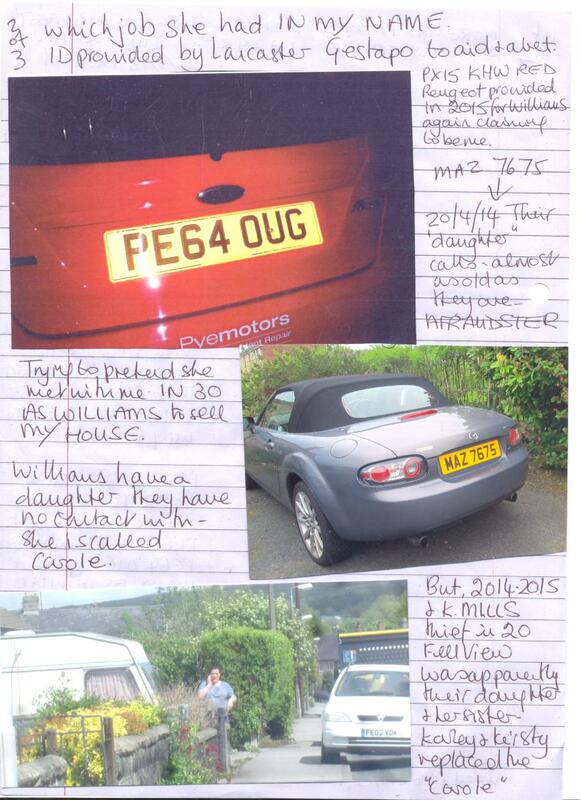 The silver Ka used in the fraud to pretend Mrs Greenbank was not missing is on photos, available on request. Thus here we have ANOTHER fraud of "moving in" and now to aid and abet those "missing their free money". Ends Carol Woods. This is typical of bullying thugs I deal with minute by minute, hour by hour and day by day, year in, year out and you all know and ignore it. From Ms Carol Woods under duress at 28 Fell View LA2 9RP. HOUSE THEFT TO BE "FORGOTTEN". Thus back to rely on CURWEN in 24 where I also apparently live after an RTA that I have never had nor has anyone in 24. BUT in 2014 when I moved to rent 28 Fell View, CURWEN was ONE household from at least 24 TWENTY FOUR to claim links to me for massive gain. Mrs LENA CURWEN and his sister claimed to be "disabled" after an RTA where they were given £50.000 FIFTY THOUSAND £'s of MY money to pretend I was then "disabled" and living in squalor IN 24 Fell View as Mrs Lena Curwen! That was MY MONEY AWARDED TO ME IN NOV 07 which has been given to VARIOUS over years who have all been used to be me. That was INDUSTRIAL INJURY MONEY (on which I paid tax but never saw the money) but as unemployed parasites are ALWAYS used to be "me" how could they have INDUSTRIAL INJURIES? They couldn't thus the Gestapo give them the money EMBEZZLEMENT OF PUBLIC MONIES as RTA. I have never had an RTA and have a maximum no claims bonus which I have had for more years than I can think of. But CURWEN was then drawn in again in yet ANOTHER "plan to see me off" which also failed. He was to leave his window like this in the photo and I was to see and FORGET THE WINDOWS IN MY HOUSE! He was hardly likely to start ripping out his windows and they had used the Masonic thugs at 39 which YOU paid for, so they couldn't return. Curwen it has to be said, often hides his car and pretends 24 is unoccupied when he lives in hiding. Mrs Curwen I have not see since YOU funded a second address for them, the sister calls for mail when there is a fraud in progress. Ends Carol Woods Ms. Under duress at 28 Fell View LA2 9RP. 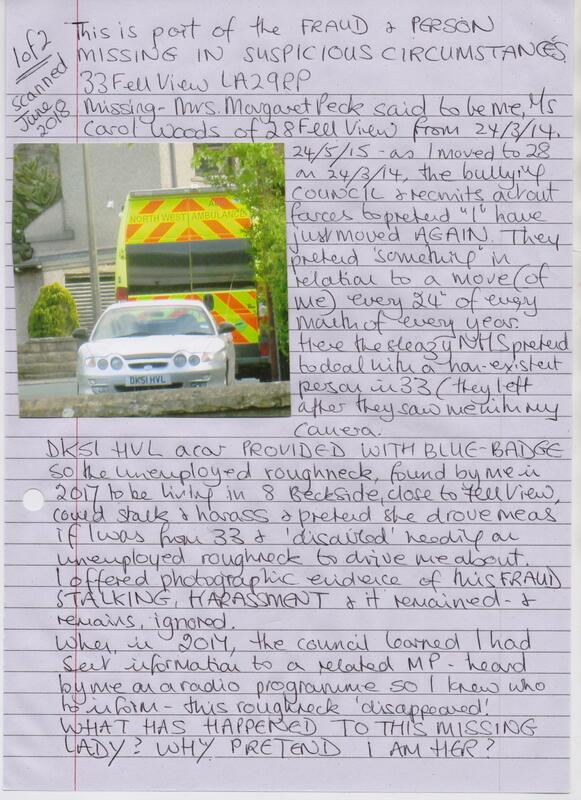 The posts here, copied from Ms. Wood’s communications, detail numerous serious crimes, and outrageous hostilities happening to Carol Woods which continue to this day – the archive made of scores of posts beginning in Febuary 2016 after certain “supporters” found out Carol had been placed in a closed mental hospital unit for the 5th [at least] time for no reason. On January 31st 2018 Carol was arrested by Lancs. 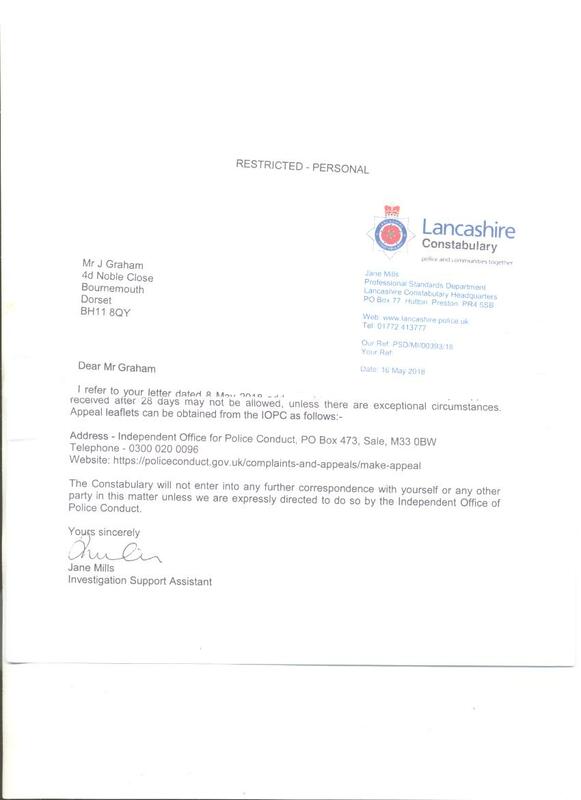 police for being myself – the owner of this site – for allegedly posting articles here – a nonsense charge easily negated by my affadavit / statement as sent to Lancs. police [the statement can be seen in the recent related post put here recently], but nevertheless this unwarranted arrest causing unnecessary hassle and more grief for Carol – the point of the exercise, probably. Carol has been falsely convicted in the past on fake charges.